On a bright fall morning in central Washington, United States, a flock of sheep, the off-white of dirty snow, moves across an emerald field of timothy. To the flock’s west, Daniel Kinka and Cafer Tepeli scrutinize the sheep through binoculars. Somewhere to the east, obscured by the cloud of livestock, is Sonny. I ask Kinka how Sonny is doing. Kinka, a Ph.D. candidate at Utah State University’s Ecology Center who wears a safari hat and two radios clipped to his belt, rubs his beard thoughtfully. “His social skills need work,” he says. For Kinka and Tepeli, the state of Washington is the final stop on a 1,500-mile (2,400-km) odyssey with an important objective: to find a better livestock guard dog. Throughout the American West, recovering populations of wolves and grizzly bears have crept beyond the boundaries of national parks, clashing with sheep and cattle as they advance. Wolf raids, in particular, have become more commonplace: In 2005, Canis lupus killed 4,400 head of cattle nationwide; by 2010, that number had nearly doubled to 8,100. What’s more, the mere threat of predation can prevent domestic animals from grazing comfortably, diminishing their body weight and market value. Little wonder, then, that offending predators are frequently shot by landowners or exterminated by government agents. A good guard dog, however, forestalls conflict by warding off carnivores before they attack. “Ideally the sheep don’t die, the wolves don’t die, the dogs don’t die,” Kinka explains. Can a domestic animal truly help restore some of the world’s wildest creatures while at the same time saving livestock? Over the centuries, however, Europe eradicated its wolves and bears, sanitizing the continent for livestock and obviating the need for guard dogs. The practice had become rare by 1972, the year the United States banned the use of Compound 1080 — a potent poison that ranchers used to eliminate coyotes, the species responsible for most of the country’s predation incidents. Though the ban was later lifted, at the time it pushed ranchers to investigate novel ways of handling coyotes and other predators. 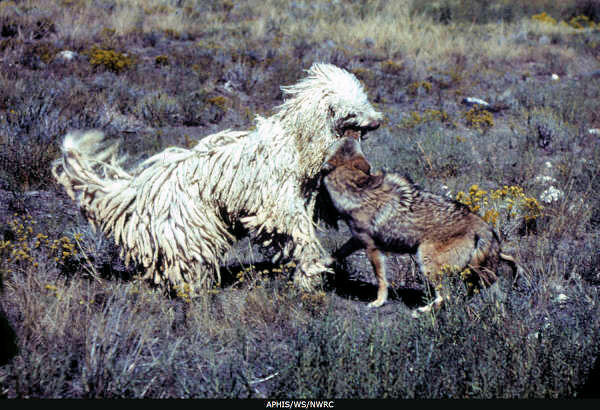 Soon, European dog breeds like the akbash, komondor and Great Pyrenees were patrolling America’s rangelands in defense of livestock. The new arrivals worked immediate wonders. In North Dakota, dogs slashed coyote predation rates on sheep ranches by 93 percent. In Colorado, where sheep producers faced not only coyotes but also cougars and black bears, dogs averted nearly US$900,000 in livestock losses in 1993 alone. One study of over a thousand dogs nationwide found that the average guard dog saved its owner US$500 to $600 annually. As word spread, a menagerie of breeds caught on — or were revived — in other countries. 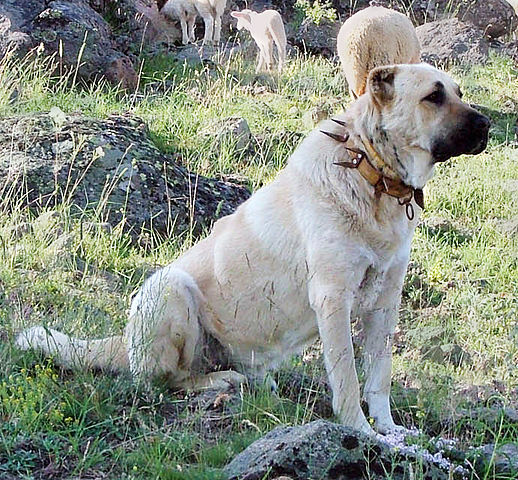 Today, there are maremmas warding off dingoes in Australia, Anatolian shepherd dogs chasing away cheetahs in Namibia, and Spanish mastiffs battling brown bears in Spain’s Cantabrian Mountains. Not only have dogs saved ranchers money, they’ve also protected the very carnivores they were recruited to deter. In the United States, unruly fauna is controlled by Wildlife Services, a branch of the U.S. Department of Agriculture that kills millions of animals each year via methods including poisons, traps and aerial gunning. Although birds comprise the vast majority of those killings, over 75,000 coyotes — one every seven minutes — were slain in 2013. By deploying guard dogs and other deterrence techniques such as electric fencing and alarms, however, many ranchers have alleviated their predator problems without resorting to lethal tactics. “If a producer has a tool that prevents predators from killing their sheep, there’s no reason to kill those predators, or to have them killed by a federal agency,” says Julie Young, research wildlife biologist at the National Wildlife Research Center, Wildlife Services’ scientific arm. Among the many dog devotees is Lisa Kimsey, a third-generation rancher who grazes sheep with her husband, Mike, in Wyoming’s Bighorn Basin. Kimsey’s family has used Great Pyrenees and akbash dogs for 20 years, and though the animals haven’t thwarted coyotes, cougars and black bears altogether, they’ve reduced the losses. The dogs even chase off ravens that peck at lambs’ eyes. But while guard dogs — not to mention guard llamas and donkeys — have proved their mettle against mid-size predators, today they face more menacing foes. Over the past two decades, wolves, aided by federal reintroduction, have recolonized the northern Rocky Mountains. Today, more than 1,700 wolves roam Idaho, Montana and Wyoming, and at least 145 prowl Oregon and Washington. Grizzly bears have clawed their way back, too: In the Greater Yellowstone Ecosystem, bear numbers have climbed from fewer than 150 in the 1970s to more than 700 today, and another 800 haunt the lands in and around Glacier National Park. Lisa Kimsey was among the ranchers who lost dogs. When a pack of wolves rolled through the Bighorns a few years back, one of the Kimseys’ guard dogs vanished, leaving nary a hair behind. Kimsey believes that the dog fell victim to larger canids. That’s where Sonny, the powerful brown-and-white dog with the dubious social skills, comes in. Sonny is a cão de gado transmontano, a mastiff bred to deter wolves in the mountains of northern Portugal. Young has chosen the transmontano and two other obscure breeds — the karakachan, from Bulgaria, and the kangal, from Turkey — to serve as subjects in a new Wildlife Services study. The hypothesis: these larger, bolder breeds will fend off wolves and bears more effectively than common dogs like the Pyrenees and akbash. Breeds like the Karakachan from Bulgaria are part of a Wildlife Services study testing whether they make better guard dogs than others used across the U.S. Photo by Daniel Kinka. “All three breeds are working with wolves in Europe, and some are in areas with brown bears, too,” Young says. Before the study’s outset she surveyed breeders and scientists and was encouraged by what she heard about the canines’ assertive behavior. “If these dogs are attacked, they continue to guard.” kangals, for instance, are renowned for not only fighting off wolves, but for pursuing them. In Turkey, many bear battle scars. Since 2013, Kinka, who’s studying the effectiveness of the new breeds, has provided more than 50 test dogs to ranchers in Washington, Oregon, Idaho, Wyoming and Montana. When I meet up with Kinka and Tepeli in central Washington, they’re making the rounds, observing the dogs in action and surveying ranchers and herders about their canines’ behavior. I ask Tepeli, a guard dog expert who’s in the U.S. on a fellowship, for his impressions of the American West. “Parts of Idaho look like Turkey!” he says with a disbelieving grin. Though publishable data are still two years away, the dogs have garnered plenty of anecdotal praise. Not a single transmontano, kangal or karakachan has been injured by a predator in the line of duty, and some have already rebuffed carnivores. One Montana rancher who had been losing sheep to bears for years hasn’t suffered a single casualty since receiving his three kangals. Even if Wildlife Services can identify a better guard dog, however, the agency faces another challenge: converting science into on-the-ground policy. Though Wildlife Services promotesnonlethal management techniques like guard dogs, electric fencing and fladry, it still racks up eye-catching body counts. In 2013, in addition to the aforementioned tens of thousands of coyotes, the agency also terminated 320 gray wolves, 345 cougars and 419 black bears. Sonny seems to have the opposite problem: He’s bonded to the sheep, but his distrust of Homo sapiens runs too deep. Though that’s not a fatal flaw, it’s proving problematic at the moment, as Kinka is trying to affix a GPS collar around Sonny’s neck. If all goes according to plan, the collar will provide valuable insight about Sonny’s movements in relation to both his flock and nearby radio-collared wolves. “We’re trying to help people, but we’re also trying to understand this novel ecosystem of wild animals, livestock and humans,” Kinka says. First, though, he has to attach the collar. Kinka, Tepeli and a wizened Peruvian shepherd named Geronimo chase Sonny around the pasture like bats after a moth; the dog dodges and weaves, ducking through the legs of his pursuers, growling irritably. After a 15-minute runaround, the men corner Sonny in a side yard and the transmontano submits. His tongue lolls from his mouth; steam rises from his heaving flanks. Geronimo whispers soothingly in Sonny’s floppy ear as Kinka straps on the GPS collar. Finally, Sonny is outfitted for data collection, and the humans back away. The guard dog leaps to his feet and bounds back to his flock. Editor’s note: This story is published on F&O under Creative Commons licence. It was originally co-published by Ensia and High Country News, a nonprofit media organization that covers the important issues and stories that define the American West. Facts and Opinions is an online journal of select and first-rate reporting and analysis, in words and images: a boutique for select journalism, without borders. Independent, non-partisan and employee-owned, F&O performs journalism for citizens, funded entirely by readers. We do not carry advertising or solicit donations from foundations or causes. Help sustain us with a donation; by telling others about us, or purchasing a $1 day pass or subscription, from $2.95/month to $19.95/year. To receive F&O’s free blog emails fill in the form on the FRONTLINES page.